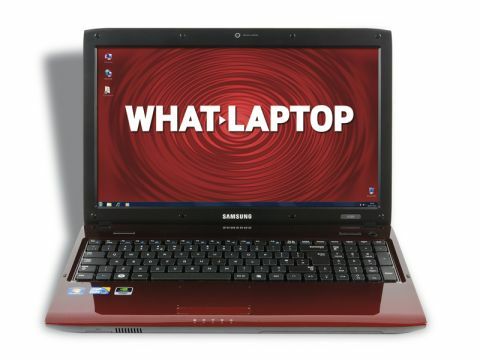 The Samsung R580 (Core i5) is the South Korean electronics giant's entry-level multimedia machine. This latest version is the first to feature a processor from Intel's Core i5 family, and offers excellent power, performance and portability at a very reasonable price that won't break the bank. The first thing to notice about the laptop is its stylish design. Instead of implementing a dull, matt-black look, Samsung has opted for an interesting red and black patterned finish. Appearing on both the lid and chassis itself, it won't be to everyone's tastes, but certainly isn't offensive and will stand out in the crowd. The 15.6-inch screen may not boast the high resolution of the Packard Bell ProBook 6440b or Sony VAIO VPC-EB1Z0E/B, yet it is just as vivid with excellent colour reproduction, while also being very bright. This makes it ideal for photographers or video makers looking for a colourful and accurate panel. The keyboard boasts an isolated-key style, with plenty of space between the keys making it hard to miss-hit a letter. It's also a very intuitive keyboard and we were typing at full speed very quickly. The laptop is powered by an Intel Core i5 processor, which works alongside 4096MB of DDR3 memory. Performance proved to be excellent, and the laptop is more powerful than all but the Sony VAIO VPC-EB1Z0E/B, which is especially impressive considering the low price point. You'll have no problems running all manner of office applications, even concurrently, and the employment of a powerful Nvidia graphics card means the laptop will run DVDs without issue, alongside more intensive 3D programs. Usually the battery life would suffer with such powerful components onboard, but that's not the case here and we managed to squeeze 221 minutes from the laptop. While this isn't fantastic and certainly won't last you all day, it is still considerably better than some rivals. At 2.6kg, the laptop is light enough to carry on a -semi regular basis - when commuting, for example - with comfort. Like the Sony VAIO VPC-EB1Z0E/B, there's an eSATA port included, which makes transferring data to external storage devices much quicker than USB, and this will suit those who regularly back up their laptop. A nice touch is that one of the four USB ports can charge your peripherals – for example, an MP3 player or smartphone – even when the laptop is switched off.